Page 1 is one of the few talented musicians that have stayed true to the essence of rap music, with a steady presence in the Detroit hip-hop scene for more than one decade, thanks to its thought-provoking real-life lyrics that provide knowledge and entertainment to the followers of hip-hop. 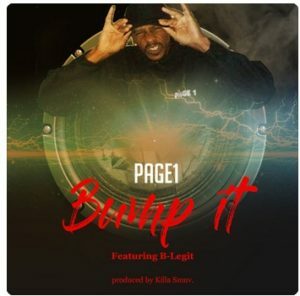 In line with the rappers goal of serving his fans across the globe with the best of entertainment, Page 1 recently announced the release of his banging new hit titled “Bump It,” where he features another rap great, B-Legit. Produced by KillaSmuv for KillaSmuv productions, “Bump It” is expected to be released on all digital music retailers on December 25th. In the amazing track, Page 1 gave a tribute to the Bay Area West Coast rappers, acknowledging their talent and tenacity to offer great rap music to lovers of good music across the globe. Over the years, Page 1 has been able to carve a niche for himself in the music industry since the release of his first single titled “Ghetto Tour Guide,” which was described as a “studio wonder”. With over 100 songs to his name, Page has worked with the likes of KillaSmuv and Mag the Po Boy with performances on different stages from Detroit to Houston. He is also currently working on his newest Moorish album, which is due to debut sometime in 2019 featuring several well-known entertainers in the hip-hop community. Page 1, also known as The Real Page1 is an entertainer, rapper, actor, and C.E.O. Born Fred Kendricks in Detroit Michigan 1973, Page 1 has continuously shown his love for making good music with influences from the likes of Run DMC, LL Cool J, Ice T, AfricaBabbata, KRS-1, Esham and NWA.